Many SME companies use Synology Disk Stations if they have a manageable amount of files to share in a small group. While you can set up a local RAID with mirrored disks to ensure the data is not lost if a disk fails, you should also take care of an off-site backup. Fire, lightning or other unexpected disasters may destroy your entire data if it is not safely stored in a second location. 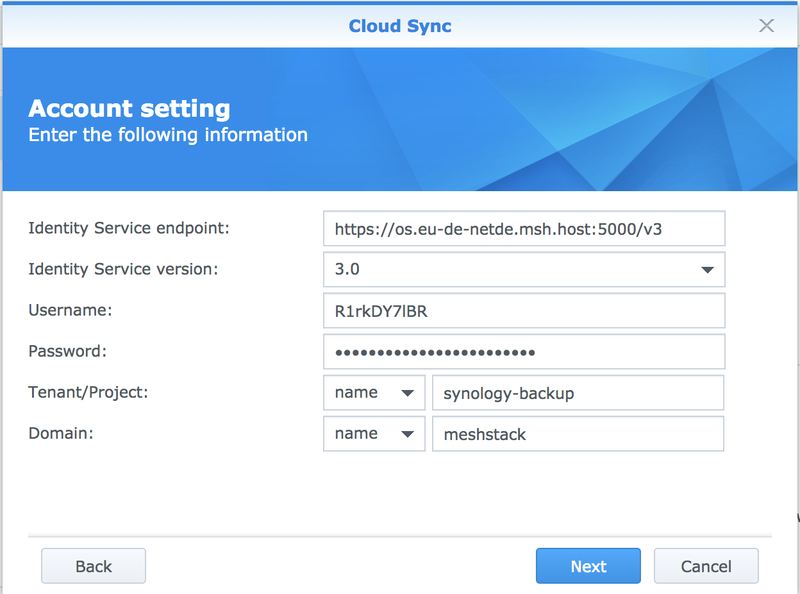 Fortunately, it is very easy to mirror your data in another cloud location in Germany with the help of Synology Onboard Instruments and Meshcloud’s OpenStack SWIFT, even with encryption if wished. This article will instruct you how. You own a Synology station with the latest software version installed on it. It is connected to the internet and carries data that you would like to save in a secure cloud location in Germany. In this article, we will create a direct synchronization that mirrors your current data into the cloud. 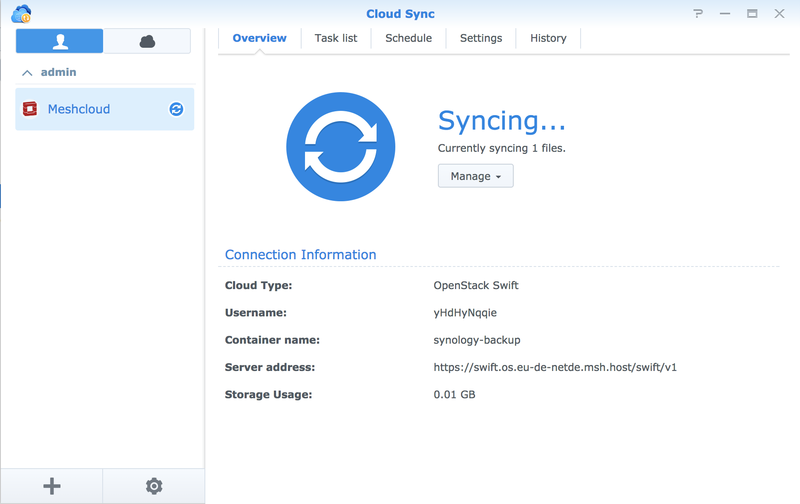 If needed, data files can then be synchronized to your (or a new) Synology again or accessed directly in the cloud. SWIFT can handle multiple backup generations as well but we will get to that topic in the next blogpost. First of all, you have to create yourself an access to our cloud by registering here: https://panel.meshcloud.io. You will get a free trial month to start with. When registered, you can create a new project, e.g. 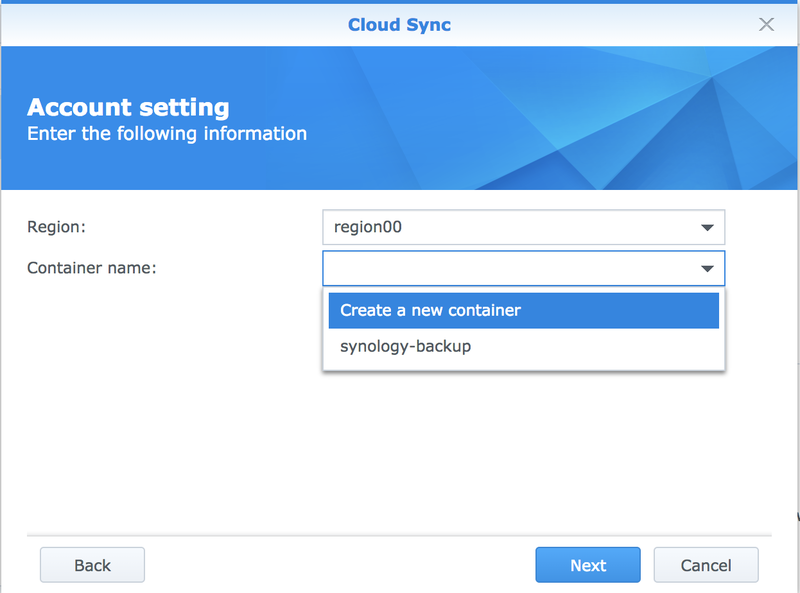 “synology-backup” and choose a location for it (if you already have a project in existence, you can also use this one instead). Choose the project and change the location. Via the entry on the Panel, you will then have to create a “service user” for OpenStack (see screenshot) which will automatically start downloading your login credentials. Save this file securely because you will need it in the next steps. The service user is the access account that we will sign into the Synology in order to obtain access to the cloud storage. Next, you will have to install the application “Cloud Sync” from the Synology application market place. 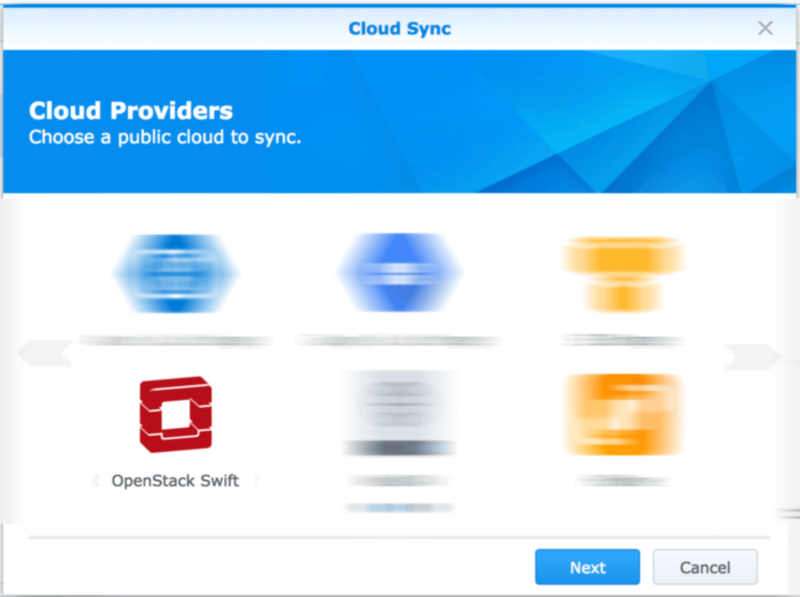 Cloud Sync enables you to synchronise selected local data in different clouds, like OpenStack SWIFT. Start Cloud Sync from the application market place and choose “OpenStack Swift” as cloud destination. In the next step, you will transfer the configuration data of the service user created above into the form as follows. Choose a region (“region00”) and an existing container or create a new container. In SWIFT, a container is comparable with the drive in Mac or Windows. As its name already suggests, the purpose of a container is to store objects (files). After confirmation, choose the new container and press “Next”. Give your synchronization connection a reasonable name (in this example Meshcloud). Local path: Here, you can choose a subfolder that you would like to synchronize. Alternatively, you can choose the uppermost folder if you would like to save all files. Remote path: Here, you can also choose remote (in the cloud of course) subfolder. As we have already created a distinct container, we will leave it with a root folder. 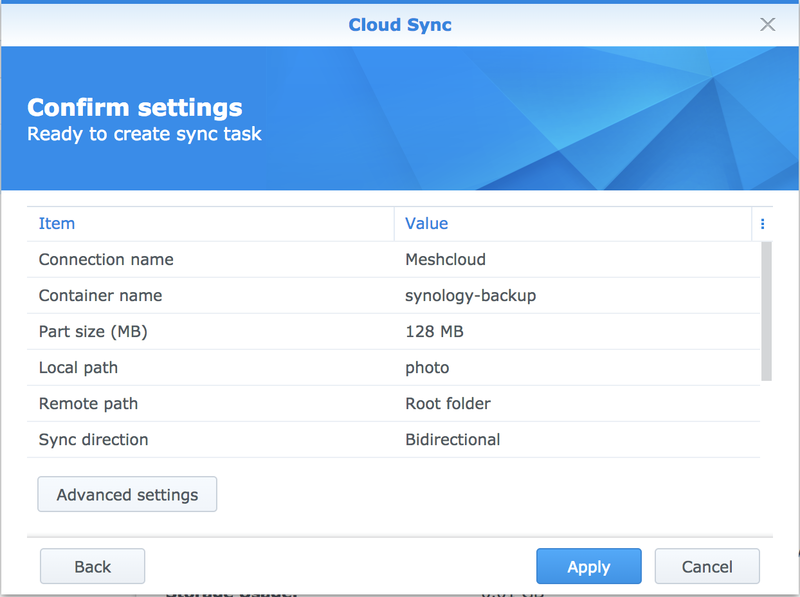 Sync direction: “Bidirectional” means that changes from the Synology to the cloud as well as from the cloud to the Synology are synchronized. If you would only like to synchronize into one direction, you can opt for that here. This is of good use if you would like to determine the Synology as the leading system and would like to transfer all changes of it to the cloud, for example. 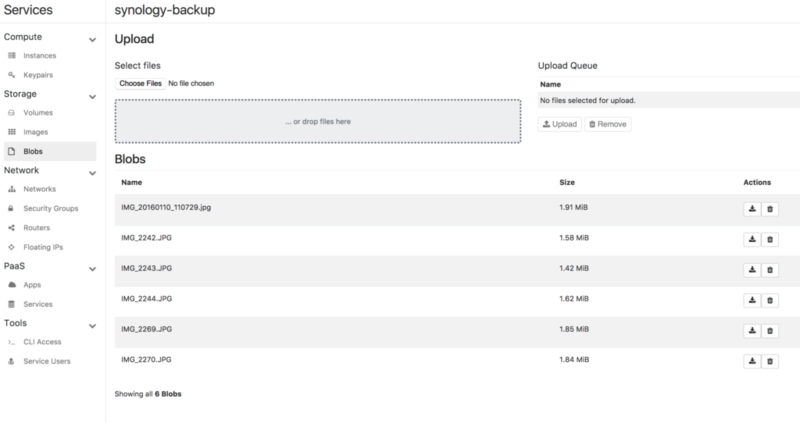 But you will have to change this value if you would like to receive a backup from the cloud for the Synology (e.g. for an empty Synology, if the old one broke). In this case, you should definitely choose “Bidirectional” or “Cloud=>Synology” here. You can leave “Part size” at default value. Enable advanced consistency check: Leave this activated to ensure that all files are correctly synchronized. Data encryption: You can choose this optionally. Please keep in mind that you will have to securely store the key file if you activate this. Because losing your key will result in the loss of your entire data (even though you have a backup in the cloud, you will also need the key to decrypt the backup). Moreover, remember that you will not be able to directly access your backup via the Meshpanel (e.g. downloading a file while traveling) if you opt for this option. Furthermore, you can optionally define times Schedule settings at which the synchronization is carried out. We will leave this for now and just mirror all data changes directly into the cloud. Press “Next” and “Apply” to start the synchronization. A nice side effect is that you can download files directly from the Panel by hitting the download button which is really helpful while traveling, for example. 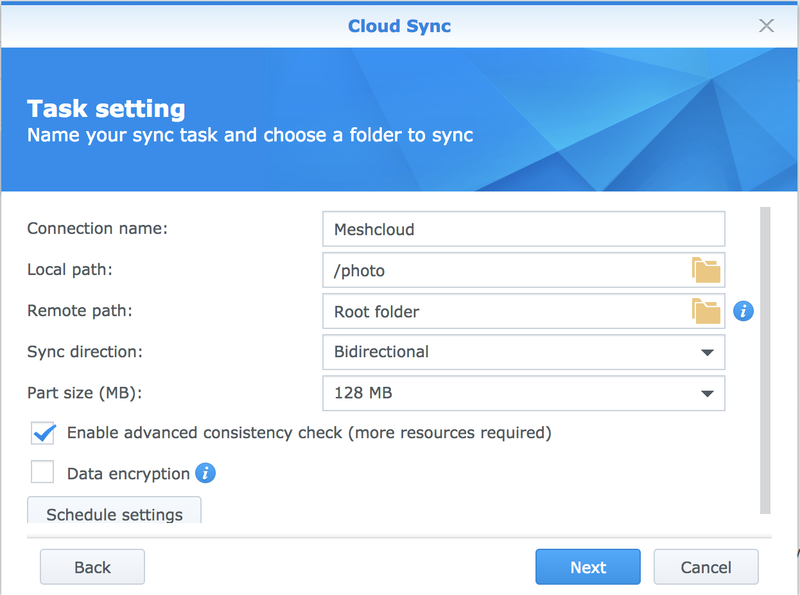 If you activated bidirectional synchronization, it is also possible to upload files to the Panel which will then be automatically downloaded to the Synology. Back in your office, you will have these files downloaded to the Synology, ready to share and edit. One issue is to figure out which user groups should be allowed to access particular data sets. For this, it is best to create multiple projects on the Meshpanel which can be authorized to different users. How to invite users via email to a project in order to grant them access to it, is explained in our documentation. Several backup generations are desirable in order to be able to use older file versions. To do this, you can either save the SWIFT data set with the help of Skript and API on a regular basis or you can use SWIFT Object Versioning with which the SWIFT Object Store automatically takes care of version management itself. We will explain the latter in another blogpost. This article serves as a first help how to manage backups in the cloud with SWIFT and some simple methods. However, due to differing technical requirements, your individual concept has to be carefully thought through. We are very happy to support with managing your individual backup scenarios on the Meshcloud Platform. Benefit from Meshcloud’s free open-source technology and the advantage of the free choice of data centers in Germany – stay in control over your data. Send us a message. If not done yet, register now on https://panel.meshcloud.io and receive a free trial month. Check our vacancies. Free positions for Frontend- and Backend Engineers and Integration Experts.